this is another post about chain letters (you may remember one a few weeks ago about a petition type chain letter). i’d like to explain what i find disturbing about another type – the prayer chain letter. chain letters are a form of emotional extortion, mixing very positive sentiments with threats or at least manipulation. let me use this one as an example. it was sent by a very dear friend. i feel uncomfortable and sad that i am taking such a well-meaning missive and criticizing it. however, i think this is precisely one of the reasons why such chain letters are perpetuated: we appreciate the good thoughts of our friends and want to show our gratitude by doing what we are asked to do in the letter. right away i feel special – but not 100%. maybe i am not the right one? maybe i will disappoint him? okay, i’m hooked again. i’ll see why … how curious! i wonder what he means! how lovely! a saint with love and thought for little things. a saint who loves flowers. and as a recipient of this message i am blessed! the prayer cannot be deleted. that sounds ominous. what happens if i do delete it? what happens if i don’t like the prayer, or find it boring, what if i’m muslim or atheist or pagan and delete the prayer because it does not fit my religious beliefs? what happens if i delete it accidentally? will i still be among the special circle of people that my friend has chosen? what does “cannot” mean? is it physically impossible to delete the message, or, more likely, will something dreadful happen if i do? i must make a wish before i read the prayer. which apparently i have little choice but to read because the prayer “cannot” be deleted. there is nothing attached. except a) i cannot delete the message, b) i must make a wish, c) send it to eleven people and d) let the sender know what happens on the fourth day. so i have to forward the message, try not to break it, otherwise i’ll be refusing a precious free gift. and you know what, even though i always break these chains, every time i do it there is a part of me that feels bad about it. i believe in blessings, i believe in prayers. every time i break one of these chains, there is this little obedient girl in me who feels bad for breaking a beautiful thing like a prayer. this is my last chance. again, a hidden thread, a warning, a raised finger. positive sentiments. i am a child of god … but am i still a child of god if i don’t follow all the directions, like the one that follows? in summary what happened here was that i get to feel special, will be blessed (by a saint? ), i will have someone wish peace, trust and contentment on me – as long as i don’t delete the message, as long as i make a wish, read the (uninvited) message, send the message to eleven people, report to the sender and believe that there are no strings attached to this procedure. that’s why i cannot help but break this chain letter. break the chain. these are chains that bind to blind, superstitious obedience, and if i pass this letter on, i am yet another link in binding others to it. if i want to wish good luck on someone, i can just do it, without any strings attached. if i want to increase the power of the good-luck-wishing by having others participate, i can invite them – again, without any strings attached. steve pavlina does a nice job of that. my job is to help people become free of their chains. so i can’t send on any chain letters. This entry was posted in blogs of note, general, spirituality, the net on August 30, 2006 by isabella mori. i have an uneasy relationship with affirmations. on the one hand i know they can work (under certain circumstances) on the other, my logical mind mistrusts them and finds them plain silly. maybe one day i’ll be wanting to step in front of a mirror and say, “i love you” but that day hasn’t arrived yet. is that an inability to love myself or … who knows? at any rate, there are some ways of using affirmations that make sense to me. one of the problems that i have with affirmations is that they often seem to contradict current reality. that offends my common sense. This entry was posted in emotional health on August 29, 2006 by isabella mori. This entry was posted in eating disorders, body image & similar topics, psychological research and other things academic, spirituality on August 28, 2006 by isabella mori. my favourite buddhist blogger right now is genkaku. here are a few thoughts he has on the phenomenon of self help, and my comment on it. This entry was posted in interesting books, philosophy and education, spirituality on August 27, 2006 by isabella mori. 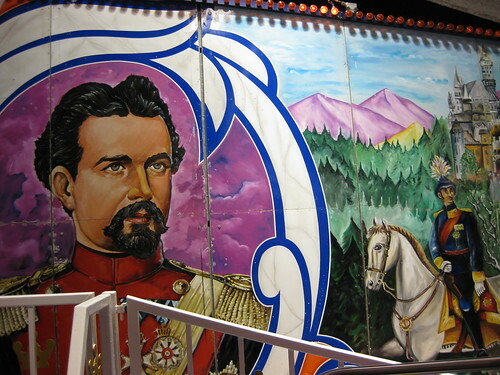 today is the 161st birthday of king ludwig II, the crazy and wonderful king of bavaria. born in munich (my hometown), he was the “fairy tale king”, the man who funded the building of castles like neuschwanstein – the prototypical palaces many north americans think of when they hear the word “castle”. king ludwig was a romantic, an unhappy dreamer, most likely gay, beloved by the people, a man with a huge vision who was way ahead of his time. long live king ludwig II – if only in the hearts of nostaligic people like me. This entry was posted in general on August 25, 2006 by isabella mori. At that moment Nicholas and Countess Mary came in. Pierre with the baby on his hand stooped, kissed them, and replied to their inquiries. But in spite of much that was interesting and had to be discussed, the baby with the little cap on its unsteady head evidently absorbed all his attention. This entry was posted in general, interesting books on August 24, 2006 by isabella mori. today i cruised the blogs of some alcoholics in recovery. i picked out some tasty morsels for you. these are real stories from real people who have gone through the black pain of alcoholism and are now accepting the sweet pain of recovery, of moving forward, one step at a time, day by day. they are words, more than anything, about giving to each other, words of gratitude, words of courage, words of realizing that every single one of us is deeply worthy of love – love for each other, love from each other and love for ourselves. This entry was posted in addictions, alcohol, blogs of note on August 23, 2006 by isabella mori. This entry was posted in interesting books, queer talk, gender issues and sexual identity, spirituality, therapy on August 22, 2006 by isabella mori.